After the success of Horrible Bosses, Jennifer Aniston and Jason Sudeikis team up again for another outrageous comedy. This time they’re smuggling drugs from Mexico! It’s already a hit across the pond, but can We’re The Millers (15) live up to the hype? What’s it about? The film starts by introducing us to pot-dealer David Clark (Jason Sudeikis), who is happy with his profession and living the “dream”. When his nerdy neighbour gets in trouble, David tries to help but ends up getting robbed and owing a drug supplier a lot of money. 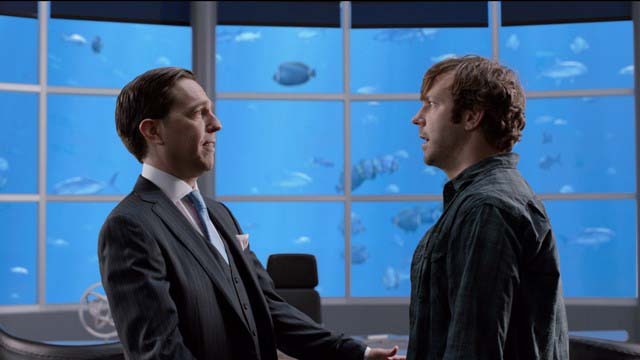 His supplier, Brad (Ed Helms), makes him an offer he can’t refuse – smuggle “a smudge of marijuana” over the border from Mexico and he’ll get payed handsomely and his debts completely cleared. While David panics about how to go through with the plan, he groups together his neighbours – reluctant stripper Rose (Jennifer Aniston), socially awkward Kenny (Will Poulter) and homeless teen Casey (Emma Roberts) – to pose as an all-American family to keep the police off his back. Verdict: The film literally kicks off with a bit of YouTube. A selection of popular viral videos get the audience laughing from the minute the film starts and thankfully the laughs don’t end there. We’re The Millers is a shocking film but in the best way possible. Yes, there’s been much hype surrounding THAT Jennifer Aniston strip scene, and she definitely looks amazing, but Aniston is at her best in this film when bouncing off Sudeikis. The rapport between the cast makes this film come together, and Dodgeball director Rawson Marshall Thurber always allows their performances to shine through, even with so many crazy scenarios being thrown into the mix. The shell of the story is ridiculously predictable, but it’s the many surprises in between that make this film such an enjoyable watch. Additional characters, such as a real-life caravanning family, create some of the most memorable scenes; while it’s safe to say that most men in the audience will wish their first kiss was anywhere near as epic as Kenny’s. And don’t go thinking most of the jokes have been given away in the trailer as there are many more surprises in store that make this film well worth a watch. From swinging couples to swollen testicles, We’re The Millers has got it all and more. Just make sure you stay for the end credits because the final take is priceless. Final Words: If you’re a fan of vulgar humour then you will have plenty to laugh about watching this film. And if you’re not, you’ll still find yourself laughing at the madness played out on screen.